A reputable kratom distributor advertising a full liquidation. Image: Healthbodyandmindcompany.com. Unless the DEA changes its mind in the 11th hour, kratom—the substance of choice for many recovering opiate addicts—is all but certain to become a schedule 1 drug in the United States this Friday, illegal to possess and illegal to sell. Distributors and users alike are left wondering what they’re going to do next. As the opiate epidemic has swept across the US, a cottage industry of online kratom sellers has blossomed. In the month since the DEA announced its intentions, that industry has been preparing for a collapse—one that has customers worried they’ll return to a life of opiate addiction. Businesses are scrambling to unload these soon-to-be illegal products. Users are caught between stocking up, seeking alternatives, or leaving kratom behind. But almost all of them agree kratom isn’t worth going to prison over. The legal status of kratom has been tenuous for some times now. State-level bans restricted sales for parts of the country, and an FDA import alert, enacted in 2014, meant any shipment or warehouse was likely to be raided at any time. 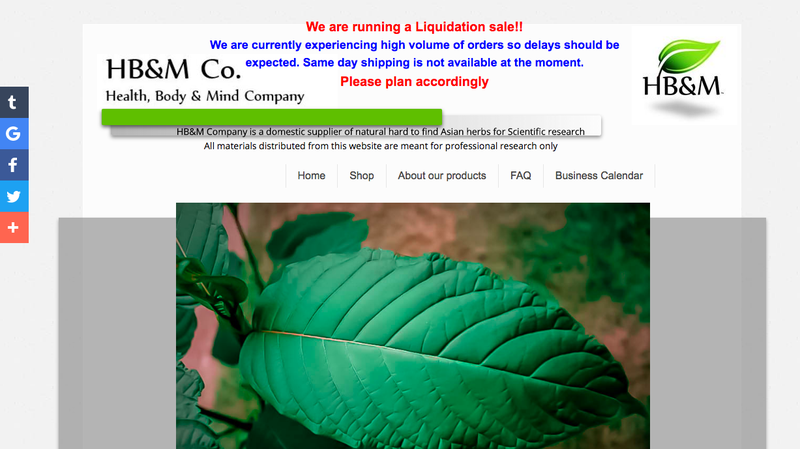 Still, distributors—many of whom take kratom themselves—remained in business, selling the powdered plant through websites like Coastal Kratom, Heath, Mind & Body Co., and Kratom One, risking the confiscation of their entire livelihoods. For recovering addicts, kratom was a godsend—a natural substance, minimally addictive, with few serious side effects, and most importantly, the ability to take the edge off of opiate withdrawal symptoms. Though the body of research on kratom’s effects in humans is slim, a wealth of online testimonies suggests it’s helped many people overcome their dependence on opiates. That all came to a screeching halt at the end of August when the DEA gave notice of its intent to emergency schedule the two main chemical components in kratom. Substances undergoing emergency scheduling can only be sent to schedule 1—the echelon reserved for the most dangerous, medically irrelevant drugs (which, incongruously, still includes marijuana, a substance that’s either fully legal or medically legal in many states). Petitions and pleas to senators from Speciosa and American Kratom have thus far been ineffective and are not likely to cause the DEA to backtrack on their decision. With the door closing fast, prices are fluctuating wildly on what is soon to be a toxic asset. Some sites have already sold through their inventory and haven’t ordered more, presumably for fear of possessing a drug that could have them sent to prison. This same fear hasn’t stopped some users from trying to stock up before Friday, with panicked threads cropping up on Reddit’s r/kratom and r/kratom corner asking who’s still selling—oftentimes with eager distributors responding. Many, on Reddit and on harm reduction forum Bluelight, are trying to hang onto as little kratom as possible. Two of the common questions raised by kratom users are—will I return to using opiates, and are there any alternatives that are similar enough? VICE speculates that many former addicts are likely to start using again without kratom, and, although there’s no way to confirm its veracity, at least one Reddit user has already claimed a family member has returned to heroin use. Suggested replacements among the community range from kava and kanna to phenibut and betel nuts. However, Kenneth wrote, “we aren’t looking for alternatives (most alternatives aren’t as safe as kratom),” a sentiment shared by many. Though it’s been in use for generations in Southeast Asia where it grows naturally, kratom didn’t gain a foothold in the US until the early 2000s, when opiate use and overdoses reached epidemic proportions. Now, a decade and a half later, it’s meeting an untimely end when many addicts need it most. Apart from the obvious and immediate impact it will have on current and former opiate users, harsh scheduling for kratom will also make funding research on the substance harder than it already was. As Scientific American reported, much of the current research samples will need to be destroyed because many of the scientists conducting them lack a license to study schedule 1 drugs. In a few short days, a hasty move by the DEA might kill one of the best hopes we had of finding a new and effective treatment for opiate addiction—and countless struggling addicts along with it.